Former England cricketer Megan Lowe celebrated her century this week with a visit from a budding Kent and England star. 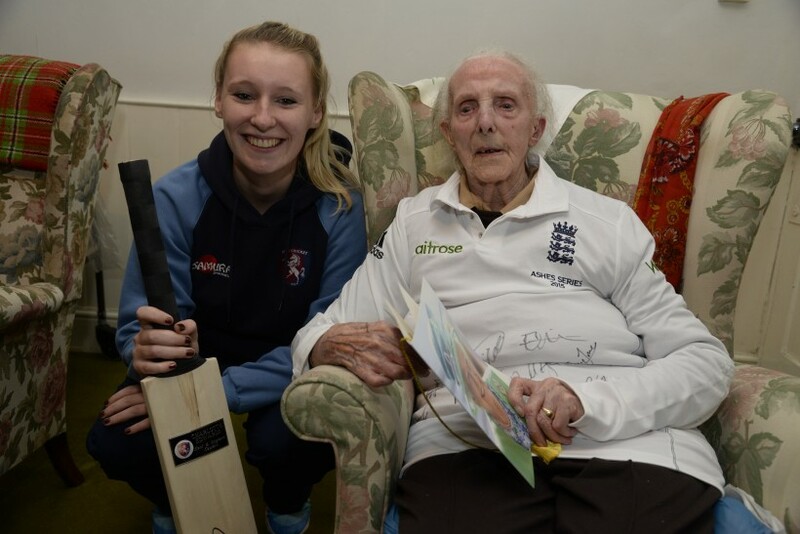 The retired teacher marked her 100th birthday with a card from The Queen and gifts including a signed England cricket shirt and Kent bat, presented by Kent and England Under-19 bowler Megan Belt. Ms Lowe, who has lived in Canterbury for more than 60 years, played for Kent and Middlesex as well as representing England either side of the Second World War. She toured Australia and New Zealand in 1948-49 with an epic six-week voyage Down Under in the days before regular charter flights. The seamer took four wickets in Tests against Australia at Adelaide, Melbourne and Sydney before playing in the only Test of the tour against New Zealand in Auckland. Ms Lowe said: “We loved the trip aboard the ship. I was granted six months leave from my teaching post. It was such an adventure and we were welcomed so warmly wherever we went. The trailblazing England tours of 1934-35 and 1948-49 were the first in women’s cricket and contrast to the professional contracts and coverage England players enjoy today. Megan Belt was a surprise birthday guest and the Broadstairs spinner presented Ms Lowe with her signed souvenirs to mark the occasion. Belt plays for St Lawrence and Highland Court CC in Bridge and was named Canterbury Christ Church University Bowler of the Year at the 2015 Spitfire Kent Cricket Awards. The 18-year-old bowler said: "It was a privilege to meet Megan and hear the stories from her England days. “She remembers it like it was yesterday and it's thanks to the early players like Megan that women's cricket is getting more recognition. “It was inspiring and I hope I can follow in her footsteps and play for my country one day." Three Kent cricketers were among the England Women that contested the 2015 Ashes series against Australia live on TV and radio including the Kia Test at The Spitfire Ground, St Lawrence in Canterbury in August. Ms Lowe said: “It is great to see the progress of the Women’s teams. We were all amateurs and had to buy all our own kit without the specialist coaching and support the players have today.